Lessons learned from good friend Cathy Freeman have steeled Marcus Harris as he sweats on a baggy green debut in next week's first Test against India. The Victorian opener has credited his chats with the Sydney Olympic champion in her kitchen with helping him make Australia's 14-man first Test squad. And her words of wisdom will no doubt come in handy as Harris prepares for the nerve-wracking wait to see if he makes the cut for the series opener in Adelaide. Harris hoped he had done enough to impress Australian coach Justin Langer after bouncing back from a first innings failure in Victoria's eight wicket Sheffield Shield loss to Queensland at the Gabba. The left-handed opener struck a fighting 62 in the second dig. But the guessing game over Australia's top six isn't over thanks to Victoria captain Peter Handscomb. 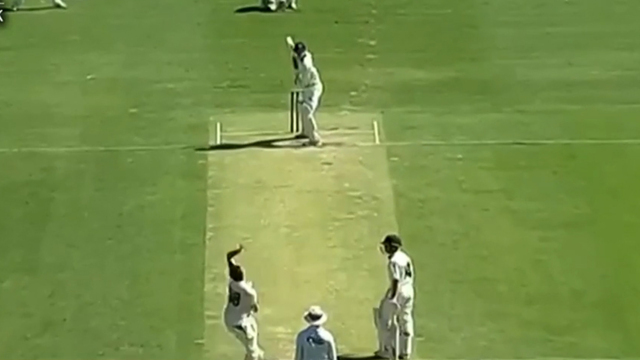 After Langer revealed the final Test batting berth would come down to Harris or Handscomb, the Vics skipper responded with 81 and 53 at the Gabba. The Test speculation would be enough to do a rookie's head in. But Harris said it wouldn't be a problem thanks to his talks with Freeman, who is married to his manager James Murch. "We have spent time just talking about the mental things," Harris said. "I spoke to her about how she dealt with the spotlight of the Olympics with a whole nation expecting and wanting her to win. "It was amazing to be able to sit in her kitchen with her and just chew the fat for an hour with her. "She is a legend of a lady. She sent me a nice text last week so that was really good - I can't thank her enough." Much has been made of Langer picking Harris in the Test squad after describing the opener as "mediocre" when he left Western Australia for the Vics at the end of 2015-16. But Harris said he was heartened to hear Langer now described the left-hander as a "little brother". "He is probably a bit too old to be my big brother," he laughed. "But that ('mediocre' sledge) didn't bother me in the slightest. "Every time I did an interview that is the first thing they bring up so as soon as he said that (little brother) I thought 'that's good because I don't have to get asked that question any more'." Plenty more questions will be asked about Australia's first Test batting line-up thanks to Handscomb's form. If Handscomb earns a middle order recall, Langer looks set to overlook Harris and opt for Aaron Finch and Usman Khawaja as his Adelaide openers. Handscomb played the last of his 13 Tests in the wake of April's ball tampering scandal in South Africa. Test opener Khawaja made a successful return from knee surgery with 41 and 18 for Queensland.